Dean Murdoch wrote: Wait, wait, wait, wait, wait. Check this out. Scroll all the way to the very bottom. It's from six years ago, but look at who Hoop Scoop has as the #1 ranked player in the NATION in the Class of 2018 (and one spot ahead of Marvin Bagley of the Sacramento Kings). If he's as good as 2017 (DeAndre Ayton), I hope we get him. Live by Hoop Scoop, die by Hoop Scoop. Could coach Cantu get Chase Adams listed? Is there any retro engineering? Little brother of D'Marques, I'm pretty sure. Shot the absolute crap out of the ball for Idaho this year as a freshman. He'd have to sit one year but would then play three, and I'd have to think he'll at least get some looks from P12 schools with the numbers he put up this year. If not...there's a gaping hole on the Pilots depth chart at SG that he'd certainly slot into nicely. Might be a pipe dream at this point after how good of a year he had, though. Little brother of D'Marques, I'm pretty sure. Great kid, great parents too...I have to believe the staff know about him, but as McCaskill and Collingsworth will likely redshirt next season, it's doubtful they'll want a player who will have to sit a year. I think the "Valpo Boys," Bakari Evelyn and Markus Golder could also be a good fit. Both will be grad transfers from Valparaiso, both would fill gaps in the lineup, and both could fill the leadership void...oh, and Golder is a Clackamas HS grad. Wearing the Howard College (a JUCO in Big Spring, Texas) shirt is 6-6 sophomore (junior next season) wing, Garrick Green, from Baton Rouge, LA. He averaged 6 points a game, which makes him a potential student athlete the Pilöts might gain a commitment from. But of course from my perspective, it would be difficult to obtain less from the small forward position. wrv wrote: He averaged 6 points a game, which makes him a potential student athlete the Pilöts might gain a commitment from. But of course from my perspective, it would be difficult to obtain less from the small forward position. I think you found his last year's stats, when he played with former Pilot guard Andre Ferguson. Garrick Green (6-6, 210) had impressive numbers this year for Howard College - leading scorer (17.2 PPG) and leading rebounder (8.2 RPG). Earned all-region honours for Howard, and most of the other all-Region 5 players appear to be off to D1 schools. Dean Murdoch wrote: Garrick Green (6-6, 210) had impressive numbers this year for Howard College - leading scorer (17.2 PPG) and leading rebounder (8.2 RPG). Earned all-region honours for Howard, and most of the other all-Region 5 players appear to be off to D1 schools. Checking various blogs and social media, it would appear Garrick is considering staying closer to his Louisiana home...can't blame him for that. wrv wrote: But of course from my perspective, it would be difficult to obtain less from the small forward position. I am happy for you Dean that you are a fan of the Simpsons. But you are here off base. My initial comment is in his reference to last's year's starter at the 3, which remains true no matter who we sign. Stating that we could not do worse when assuming even lower statistics than apparently were the case for that potential recruit was reference to last year's starter. Then learning that the recruit had higher stats than anticipated was good reason to root for his taking seriously the Pilot offer. But alas, no such luck. Whether the staff and Porter can land recruits that will help the squad is of real concern to any fan of the Pilots. All in fun, wrv. I know what you meant. Dean Murdoch wrote: All in fun, wrv. Exactly, something we need more of around here when it comes to basketball. JimmAlacki wrote: UP should go the grad transfer route. They would be immediately eligible, experienced and would be gone after the one season. DoubleDipper wrote: I think the "Valpo Boys," Bakari Evelyn and Markus Golder could also be a good fit. Both will be grad transfers from Valparaiso, both would fill gaps in the lineup, and both could fill the leadership void...oh, and Golder is a Clackamas HS grad. The combined "quiet/dead period" began on April 1 and ends at noon this coming Thursday, but apparently Bakari Evelyn and Markus Golder visited UP March 29-31. DoubleDipper wrote: The combined "quiet/dead period" began on April 1 and ends at noon this coming Thursday, but apparently Bakari Evelyn and Markus Golder visited UP March 29-31. Those guys are from Valpo, not Vandy! Dean Murdoch wrote: Those guys are from Valpo, not Vandy! Thanks for reading the post, regardless of its accuracy. Added: Today is TP's 56th birthday...my excuse is I'm not that young. Cody Collinsworth and Donyae McCaskill have signed, and JUCO SF Garrick Green from Baton Rouge, high school PG Chase Adams from Chicago, and JUCO Wing Sean Miller-Moore from "not up there," but "over there," or even down there (thanks Deaner) around Mississauga, in Brampton, Ontario are still on UP's radar as possible signees this month. 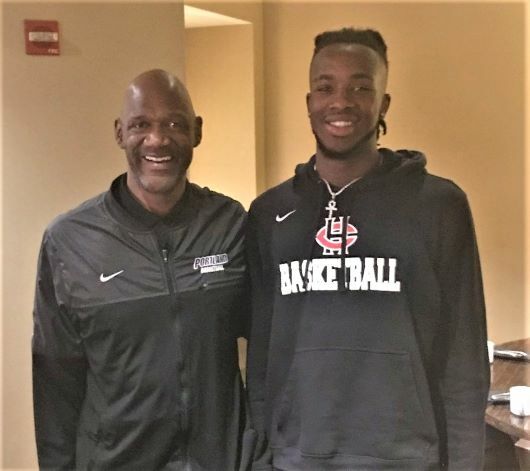 Clarence Jackson, the prep school kid from Georgia, has decided to attend JUCO Polk State College, and contrary to Verbal Commits list of offers, UP is no longer looking at Jawaun Daniels and Chol Marial. Nick Blake who we've listed on this thread, has reclassified to 2020 by attending prep school. I’m confident UP is looking at or has offered scholarships to players that are NOT in this thread or listed on Verbal Commits, and as mentioned before, Valpo grad-transfers PG Bakari Evelyn and SG Markus Golder were spotted on campus at the end of March....and they could be a huge help to the young and leaderless UP team. Do the Pilots have a serious and/or realistic recruitng interest in any of the NW Shootout participants? wrv wrote: Do the Pilots have a serious and/or realistic recruitng interest in any of the NW Shootout participants? TP has stated he's looking to sign grad-transfers and JUCO players. Regardless, there are really no unsigned or uncommitted D1 caliber players left on either the Oregon or Washington squads except for one Washington kid who has offers from UK, Texas, and UCLA. Two of the Washington players are headed to GU as part of what could be GU's best recruiting class ever...and there are at least two UW recruits and a Michigan recruit among the players. The only local player staying local, that I know of, is going to PSU. On the girls teams, one of the Oregon girls is LMU bound, and the Washington squad has one player headed to SCU and anther to LMU. He wasn't on the Northwest Shootout roster, but it looks like the Pilots have offered RJ Veliz from Woodburn a spot as a walk-on. Dean Murdoch wrote: He wasn't on the Northwest Shootout roster, but it looks like the Pilots have offered RJ Veliz from Woodburn a spot as a walk-on. With point guards Brian Smith and Xavier Hallinan both moving on, RJ will be a welcome addition to the "scout" team and could eventually earn some playing time. The LOI signing period begins tomorrow (4/17)….and the questions are, how many open scholarships are available, and is UP actively recruiting any freshmen? If, as rumored, Josh Phillips does not return, there are presumably four open scholarships. Are signees Collinsworth and McCallister still intending to come to UP after their recruiter, Coach Cantu, was dismissed? Yes, they are bound by the LOI they each signed in November, but it would be stupid for the staff to hold them to that if they've changed their minds. TP describes McCallister as VERY athletic, but more of a defensive specialist coming out of high school...(another Rashad Jackson? ), and TP tells us the 7-foot Collinsworth can protect the rim, play back to the basket, and also shoot the 3-ball. UP has only one known offer to a high school player, 5-6 point guard Chase Adams, and there have been visits by at least two grad-transfers and two JUCO guys, and apparently more are being scheduled...so it's really anybody's guess if we'll see any UP signing activity this week.